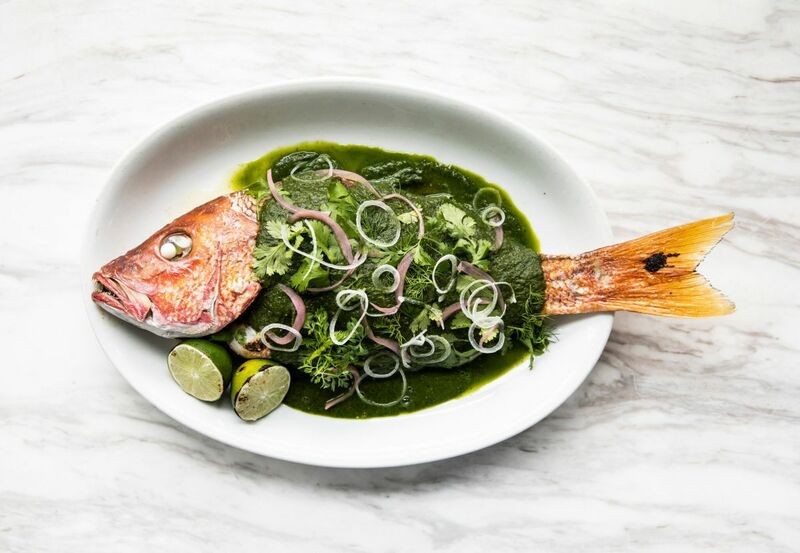 The whole Roasted Snapper Verde at UB Preserv. Photo by Julie Soefer. It’s no secret that Houstonians love to eat out, which has resulted in a vibrant dining market that supports new restaurant openings every single month. Some places, though, are more buzzworthy than others. With so many new dining options cropping up all the time, how does one choose? Welcome to the inaugural “Hit List”: our top picks for the new restaurants that we think diners should check out at least once in the near future. Without any further ado, we bid you happy eating at these new and notable places. The vegan queso at Beaver’s. Photo by Chuck Cook Photography. Beaver’s, 2310 Decatur: The original Beaver’s just off of Washington Avenue is back in business and it marks a homecoming of sorts for executive chef Jonathan “J.J.” Jones. Jones, now also an operating partner, was the chef in its prior heyday in earlier part of the decade. That was back when diners were buzzing about its cocktail program and chicken fried steak made with an actual steak instead of cheap pounded beef. Things have changed a bit now that Jones is back to reflect both his longer résumé and the need to serve more health-conscious diners. Jones has brought with him the deeply flavored, slightly spicy pumpkin seed hummus that he first came up with during his time at Concepción. 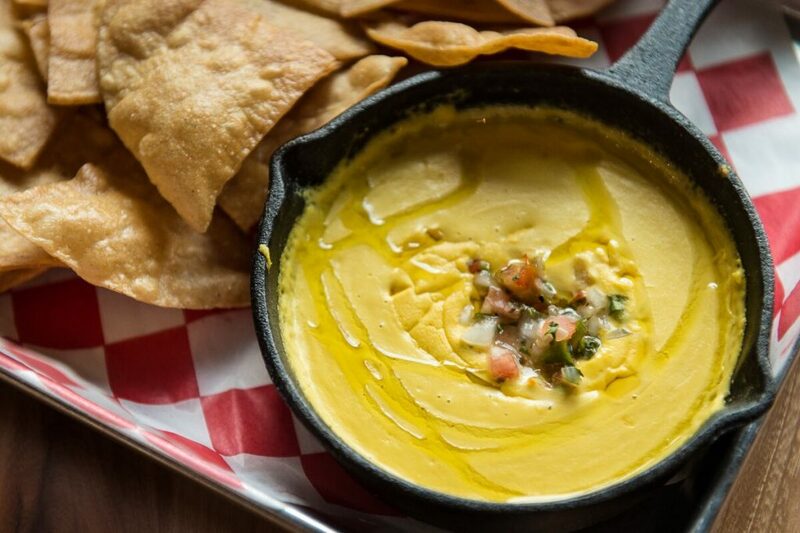 There is now also lighter fare like Vegan Queso. It’s made with yellow cauliflower, tomato and habanero and is so creamy diners might forget that there’s no actual cheese in it. Rest assured, though, that the most classic Beaver’s dishes still have a home, including that aforementioned chicken fried steak, Nacho Mamas Oysters and Beaver Balls. The Lunayena. Photo by Julie Doniero Photography. Calle Onze, 222 West 11th: This recently opened Heights charmer from the team behind Edison & Patton offers over 30 hand-crafted cocktails on their menu and close to 400 different types of agave spirits. Calle Onze’s standout libations include Greg Perez’s creamy Lunayena and the refreshing honeydew margarita. These pair perfectly with innovative plates like roasted corn saffron risotto and traditional items like Ostiones Asados (wood-grilled oysters) and Elote Callejero. Calle Onze also boasts a wrap-around, dog-friendly patio. Patrick Feges of Feges BBQ on brisket-slicing duty. Photo by Phaedra Cook. 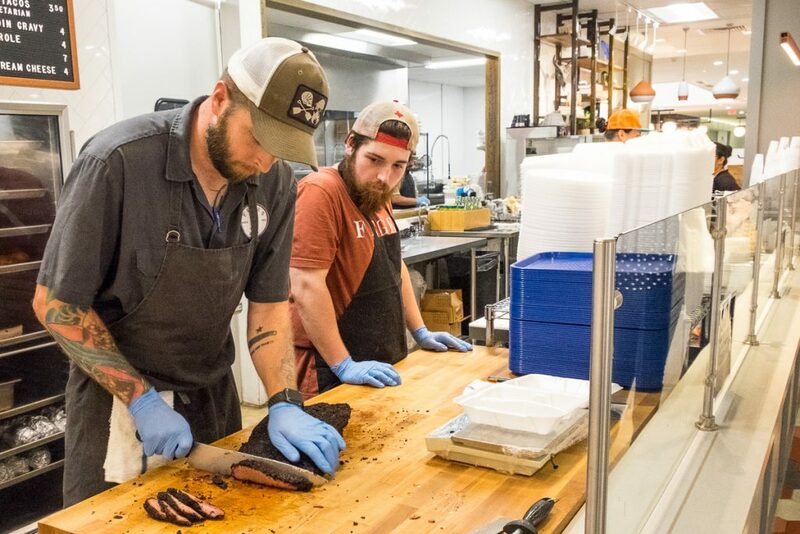 Feges BBQ, 3 Greenway Plaza, Concourse Level: Husband and wife team Patrick Feges and Erin Smith sure know their barbecue. Feges BBQ serves both breakfast and lunch in what’s been deemed Houston’s best office food court, located in Greenway Plaza. (Parking is easy for visitors, too. Just pull into the underground garage for 3 Greenway off the Highway 59 feeder and don’t forget to get the ticket validated before you leave the food court.) The lunch menu is comprised of smoked meats, housemade boudin, sausage, pulled pork and a selection of side dishes. The side dishes alone are worth visiting for and include Moroccan Spiced Carrots, Sweet + Spicy Sprouts and Yogurt + Cilantro Slaw. For those looking for a meaty breakfast, Feges offers brisket, pork (and vegetarian) tacos and a biscuit + boudin gravy that’s worth getting up early and waiting in line for. Gus’s World Famous Fried Chicken. Photo by Phaedra Cook. 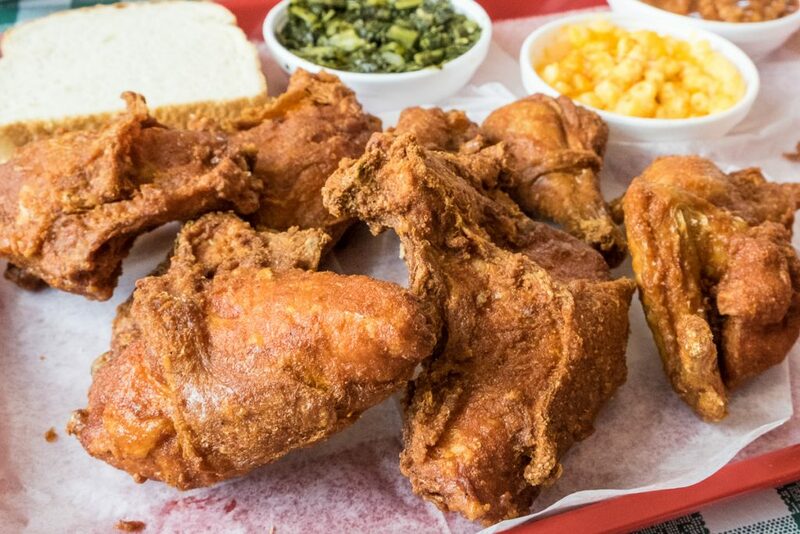 Gus’s World Famous Fried Chicken, 1815 Washington: This popular fried chicken restaurant, which started in Memphis, Tennessee, opened its first Houston location this past month. The secret family recipe has garnered praise over the years from the likes of GQ, The Food Network and Huffington Post. The fresh, hormone-free chicken is fried in peanut oil. Pieces can be ordered individually (breast, thigh, tender, leg or wing) or as part of plates served with a few sides. Those include baked beans, slaw and white bread. Other starters and side dishes include fried green tomatoes, fried okra and macaroni and cheese. The drink selections are as unfussy as a 16-ounce Lone Star or as fancy as a $300 bottle of Dom Perignon. Nobu, 5115 Westheimer: One of the world’s most recognizable names in sushi restaurants, Nobu, opened its second Texas location at the Houston Galleria. While only time will tell if well-heeled Houstonians continue to frequent this hotspot once the buzz dies down, there is no debating Nobu is in a class of its own. Must-have signature dishes include the black cod miso and the yellowtail sashimi with jalapeño. On the drink side of the menu, whiskey fans will be intrigued by the Nobu Sidecar made with Iwai Japanese whiskey, Gran Torres Oranges and yuzu juice. The butcher’s block at Postino Wine Cafe. Photo by Becca Wright. Postino Wine Café, 642 Yale: This wine lover’s paradise nestled in a corner spot of bustling Heights Mercantile is home to over 20 wines by the glass or bottle. There are also roughly 40 off-menu red and white selections. No slouch in the craft beer department, Postino also has 10 on tap with a rotating local draft selection and over 20 bottle and canned beers. The food menu features noshes like a selection of Luques, Picholine, Gaeta, Red Cerignola, Arbequina and Castelvetrano olives; NYC Grilled Cheese with Sierra Nevada mustard, ketchup and pesto, assorted bruschetta and paninis. 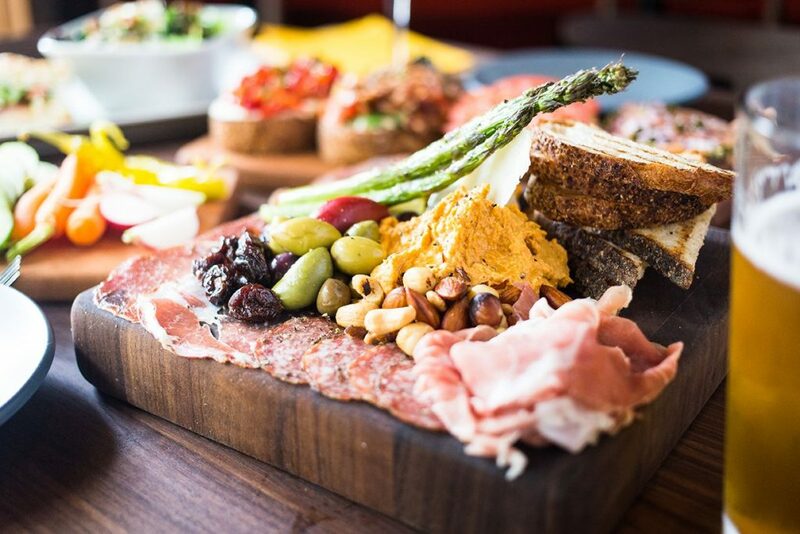 Since nothing goes better with wine than cheese, Postino also serves one heck of an artisan cheese board and a butcher’s block with meat, smoked almond hummus, asparagus, olives, nuts and crostini. Add to all of this Postino’s ample patio and you’ve got a destination worth relaxing at with a glass of wine (or three). Do note that parking during peak times can be difficult (the parking lot isn’t really big enough to support all of the merchants in Heights Mercantile) so it’s better to go off-hours. Some street parking is available. The Wild Strawberry dessert at Poitín with Ponchatoula strawberries, miso, meringue and black pepper. Photo by Phaedra Cook. 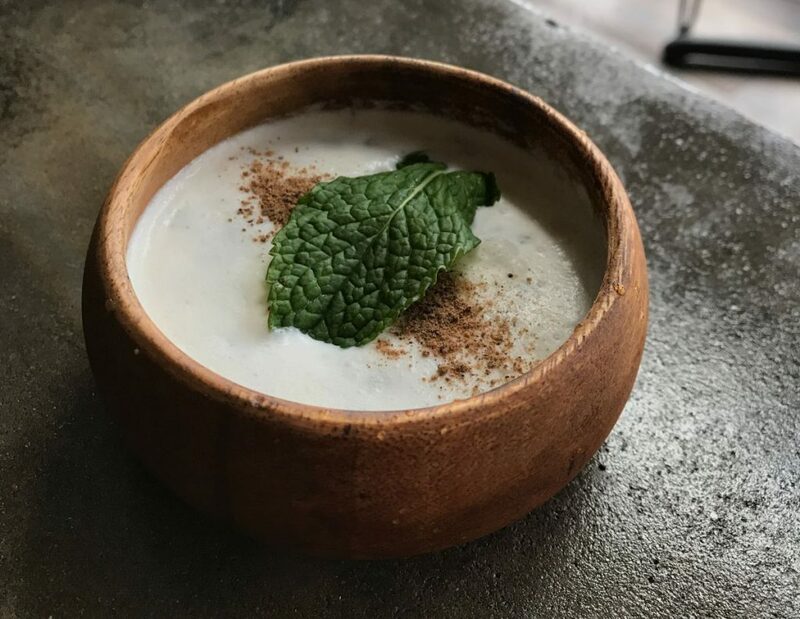 Poitin, 2313 Edwards: Ian Tucker’s ode to his Irish heritage opened in Sawyer Yards this May. (He also owns Balls Out Burger in the Heights.) The executive chef is Kiran’s alum Dominick Lee and the glassy space is casual yet sophisticated, with an awesome view of the downtown skyline. Small plates are decidedly southern-inflected, like the Pick Ya Flavor Pork Skins with your choice of tomatillo-guajillo, Cajun or Saigon kick seasonings and the heritage breed pork collar. Heartier dishes include skillet-basted cauliflower steak and heirloom polenta. 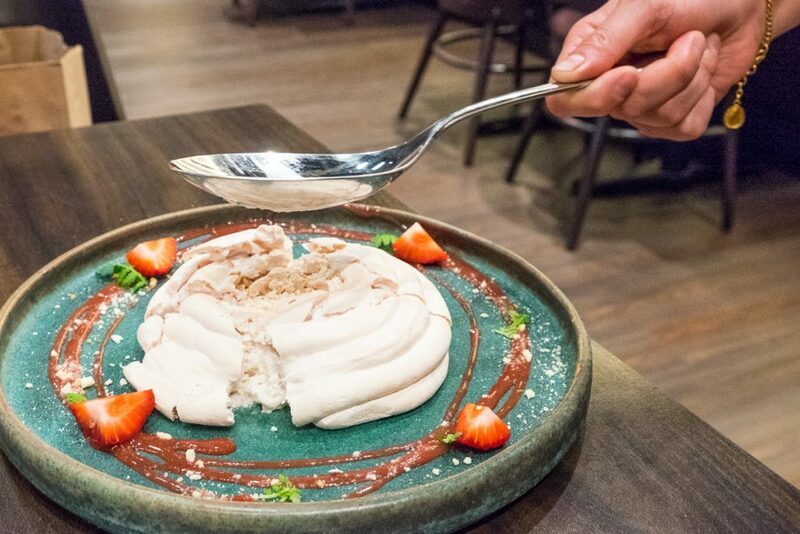 The Wild Strawberry dessert, with Ponchatoula strawberries, miso, meringue and black pepper, is an interactive dish from pastry chef Dory Fung. Half the fun is cracking the big meringue with a huge spoon into bite-sized pieces. The other half is eating it. 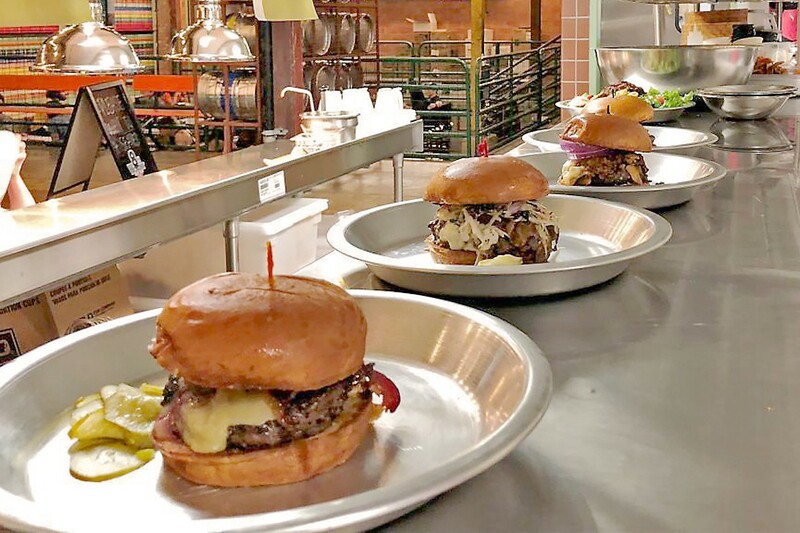 Rodeo Goat’s open kitchen with a lineup of burgers ready to serve. Photo by Beth Levine. Rodeo Goat, 2105 Dallas: Texans love great burgers and Dallas transplant Rodeo Goat delivers the beef. There are over 20 different burgers to choose from, with the meaty options (yes there are vegetarian options as well) being made with beef from 44 Farms. The selection includes classics like the River Oaks C.C. (with lettuce, beefsteak tomatoes, onions, pickles, cheddar, mayo and mustard) and those with more imaginative toppings like the Luv Ya Blue (with blue cheese coleslaw and caramelized onions). Rodeo Goat also offers an array of appetizers like the Cheese Fries Surprise — hand-cut fries with an array of toppings that can change daily — and Goat Chips, Rodeo Goat’s potato chips seasoned with sugar, pepper and paprika. There are over 30 different beers to go along with the food. Crispy Rice Salad at UB Preserv. Photo by Julie Soefer. UB Preserv, 1609 Westheimer: James Beard Award-winning chef Chris Shepherd’s new restaurant, described as the “evolution of Underbelly,” opened just down the street from its Montrose predecessor in May. Head chef Nick Wong has given UB’s menu new perspective and the dishes are influenced just as much by worldly Eastern fare as by Southern. So far, the execution has been exemplary. The crispy chicken wings are tangy on the outside but juicy and soft inside. 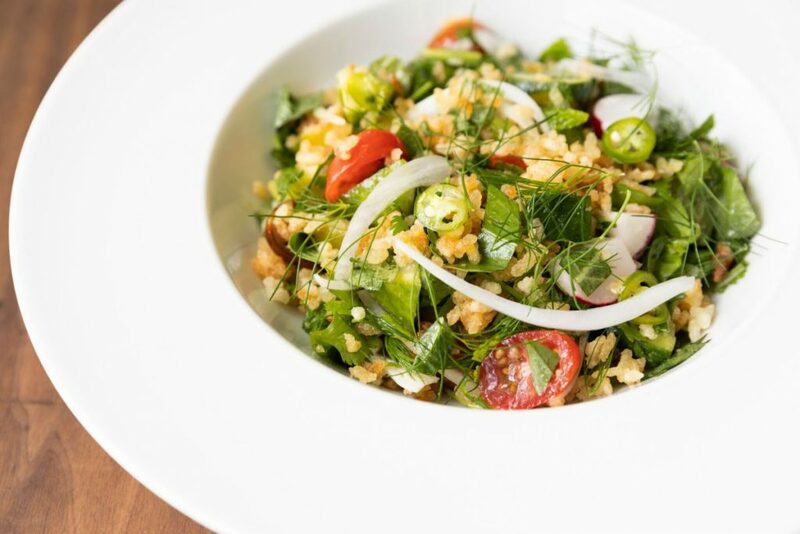 The Crispy Rice Salad showcases UB Preserv’s flair for combining ingredients you might not expect like crisped rice, mint, cucumber, tomatoes and Serrano pepper. Spirit’s Director Westin Galleymore’s cocktail menu includes festive, well-made tiki bowls for small groups, like the Wild Man of Navidad with both rum and bourbon. Of course, there are innovative, individually sized cocktails, too, like the Adult Entertainer with dry gin, passion fruit, lime and vanilla served with a shot of rosé alongside. Dumplings at Wanna Bao. Photo Courtesy of Wanna Bao. 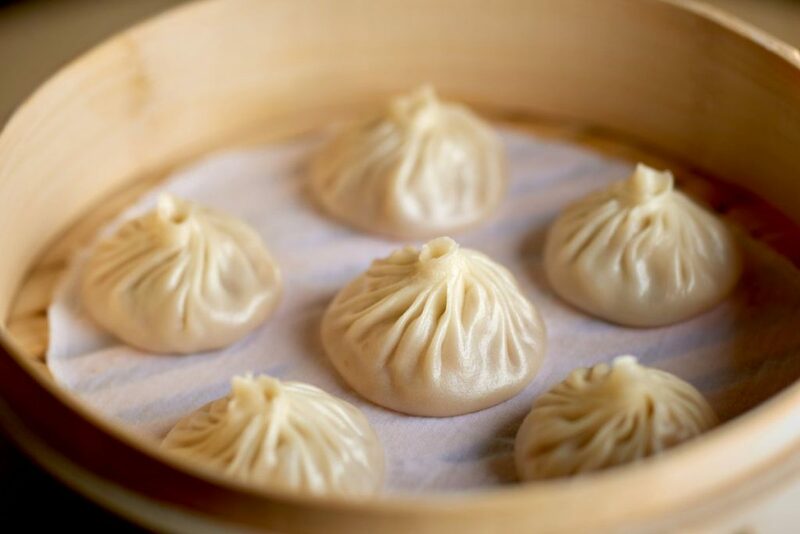 Wanna Bao, 2708 Bagby: Wanna Bao quietly opened its doors in midtown this past month and specializes in Shanghai and Chengdu cuisine with an emphasis on soup dumplings. The owners are first-time restaurateurs Dean and Grace Dee. (Dean has roots in the business, as his parents own One Dragon Restaurant on Bellaire Boulevard.) The Shrimp Xiao Long Bao, or shrimp- and pork-filled soup dumplings, and the Pork Crispy Bottom Bao are must-haves. Note that these are for dine-in only and can’t be taken to go. The menu also features “street food” like scallion pancakes and Red Oil Dumplings with pork. There are also intriguing vegetable-based (albeit not necessarily vegetarian) dishes like Sunrise Corn coated with duck egg yolk and the Shitake Loves Baby Bok-Choy. Wanna Bao also serves a selection of local draft beers, TsingTao and Kirin Ichiban imported beers and canned mead.